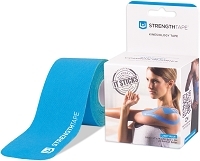 STRENGTHTAPE® is the preferred brand of Kinesiology Tape in the Medical Market and is widely used by professionals worldwide because of its long-lasting durability and effectiveness on common injuries. 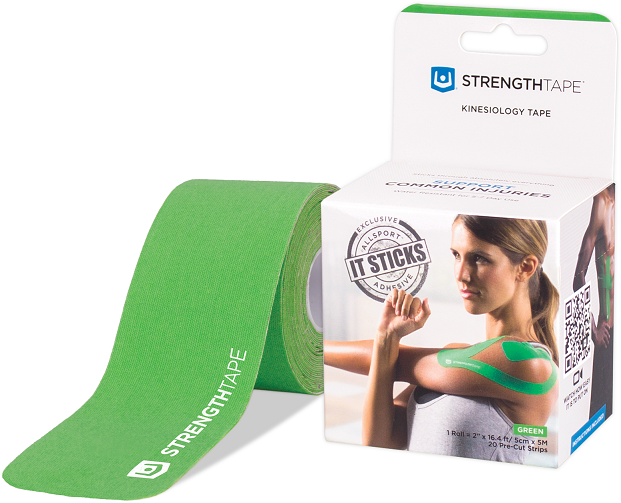 Our exclusive All-Sport™ Adhesive helps StrengthTape® stick for up to 7 days through water, sweat, or most conditions to support injured muscles and tissues while still allowing full range-of-motion. 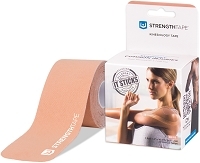 STRENGTHTAPE® is made of a breathable cotton and quick drying Spandex specialized weave that provides a stretch identical to human skin, making it the most comfortable tape on the market. STRENGTHTAPE® 5M Rolls are 2” wide and 16.5 feet long, enough tape for 10-12 average applications. The Pre-Cut versions come in perforated 10” strips that are easy to peel off. To get the best size, our tape can be cut into the perfect length. Check out our application videos on our website. Will stick for up to 7 days in any environment including Water, Sweat, and even High Humidity. tape to activate the adhesive. be trimmed if they lift. Gently remove tape from skin.